Manyin (second left) receives a memento from Dawos. From left are Detta, Wilson and Kesian. KUCHING: Many qualified candidates from the Bidayuh community can stand in the Puncak Borneo parliamentary constituency for Barisan Nasional (BN) in the event incumbent Datuk Seri James Dawos Mamit is not re-nominated. Without revealing names, Manyin said there are “almost 20 potential candidates”, who could contest in the seat for the next parliamentary election. “I am not the Chief Minister and I am not the Prime Minister, so I have no power to say (who the candidate is). The candidate is the prerogative of the Chief Minister and the Prime Minister, but what I can say is that whoever is the BN candidate, we will support,” the Parti Pesaka Bumiputera Bersatu (PBB) vice-president told reporters after opening the PBB Mambong triennial general meeting (TGM) yesterday. 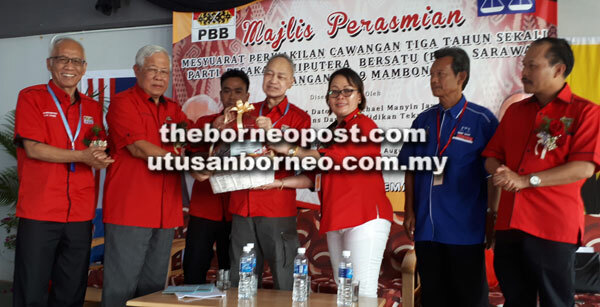 The PBB Tebedu chairman stressed the “almost 20 potential candidates” merely demonstrate there are many qualified members of the Bidayuh community. It is understood that Dawos may not defend his seat due to poor health. In February, he had proposed Datuk Detta Samen – his special officer and PBB Mambong deputy chief – as a potential replacement. Since then, many names have surfaced and they have been actively lobbying for the seat. Dawos first won the then new Mambong seat in 1999, when he stood as a direct BN candidate. He joined PBB after winning the election. Meanwhile, the PBB Mambong branch TGM saw a contest for the youth chief’s post. Wilson Ahon defeated incumbent councillor Bronnie Marshall. Dawos remains branch chief, while Kesian Sandah continues to head the women’s wing.